Naples-based EBL Construction, in conjunction with EBL Interiors, has completed the interior renovations of a luxury condominium unit at The Biltmore at Bay Colony in Naples. EBL Construction fulfilled the construction renovations required, including the installation of new Kerlite Geoquartz flooring by Cotto d’Este, electrical, plumbing and HVAC. EBL Interiors created a stylistic kitchen design to include Code by Snaidero cabinetry, Miele appliances, Liebherr wine cooler, Ceasarstone quartz countertops, Franke faucets and a set of double Farsetti Arte doors. EBL’s signature drop ceiling completed the space. 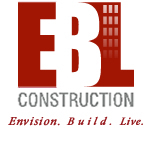 EBL Interiors provides design options for single- and multi-family residences, including new construction and renovation projects for both commercial and residential clients. The EBL Interiors showroom, open to the public and to the trade, is open in North Naples and offers products from premier manufacturers including Snaidero, Gaggenau,Vaghi, Biesse, Cotto d’Este, Miele, Franke, Steel Time and Max Fire, Farsetti Arte, EP Porte, EBE Porte and more. Custom, waterproof art panels are also available from Italian art designer Alex Turco.